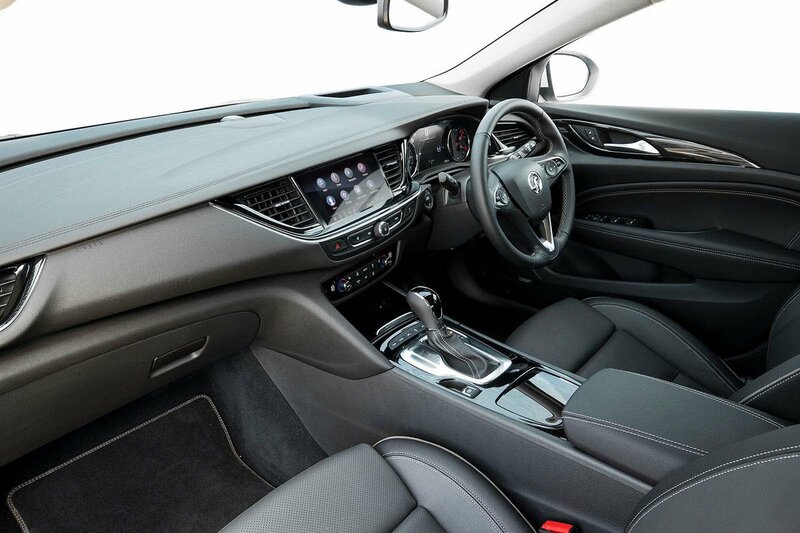 Vauxhall Insignia Sports Tourer Performance, Engine, Ride, Handling | What Car? A wide range of petrol and diesel engines are available, the cheapest being a 1.5-litre turbocharged petrol with either 138bhp or 163bhp. We’ve tried the higher-powered option, finding it flexible from low in the rev range and fairly fuel-efficient. Given the small price, emissions and fuel economy penalty over the 138bhp version, we’d say it’s worth considering, particularly if you don’t do many miles. There’s also a 1.6-litre petrol with 197bhp available with a manual or automatic gearbox. This really starts to push the list price up, but does provide considerable extra punch. With the automatic gearbox, it pulls away quickly from a standstill and builds through revs smoothly with gear changes that are almost unnoticeable. What is noticeable, though, are the CO2 emissions, which are higher than those of the smaller petrol unit and bring a big jump in company car tax costs for business users. Moving on to the diesels, there are four available: a 1.6-litre with 108bhp or 134bhp and a 2.0-litre with 168bhp or 207bhp. The less powerful 1.6 is surprisingly willing and is by far the cheapest engine to run. That said, those who regularly have a full car would be better off with the more potent 1.6. The 168bhp 2.0 diesel (the only option if you want the more rugged Country Tourer model) has a much more muscular mid-range than the 2.0 petrol and isn’t much slower in terms of outright pace. Ultimately, though, the additional cost means you should only consider it if you plan to tow a caravan or heavy trailer. As for the 207bhp version, this feels barely any quicker. So the facts that it is one of the least economical 2.0 diesels on sale – it officially averages 38.7mpg but will undoubtedly do less in the real world – and is only available with the decidedly expensive GSI Nav and Elite Nav trims, make it an engine we’d recommend avoiding. 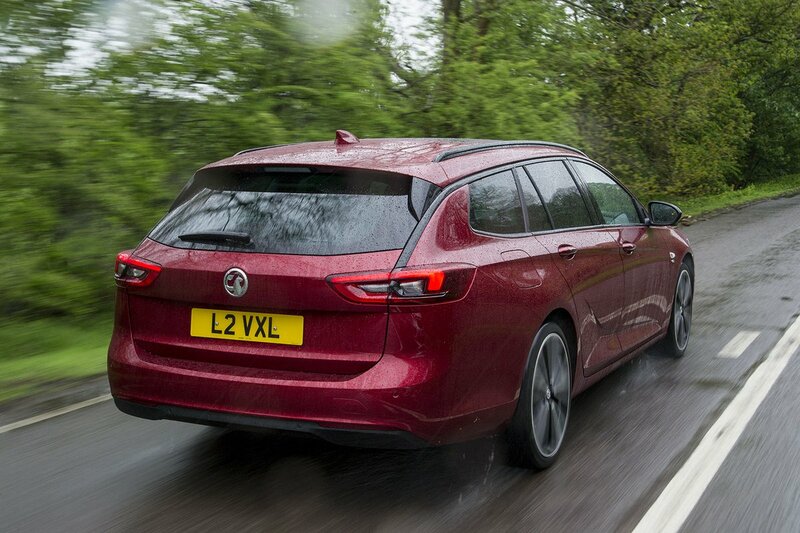 Driving an example with the standard suspension and relatively small 17in wheels, we found the Insignia Sports Tourer handles crests and compressions on smooth roads in a relaxed – if slightly floaty – way. But throw in some craggy surfaces and the ride quickly deteriorates; the car fidgets noticeably and thumps over sudden obstacles such as potholes. Adaptive dampers – dubbed FlexiRide – are standard on the GSI Nav and Country Tourer models and optional elsewhere in the range. They offer greater pliancy over larger undulations when set in the softest Comfort mode, but the ride is still jittery over smaller imperfections, especially on the biggest 20in wheels that come as standard on the top petrol and diesel engines and are optional on other models. Set it in the stiffer Sport mode and the ride is just plain firm on UK roads. Whichever suspension choice you make, try to stick to 17in or 18in wheels if comfort is a priority. 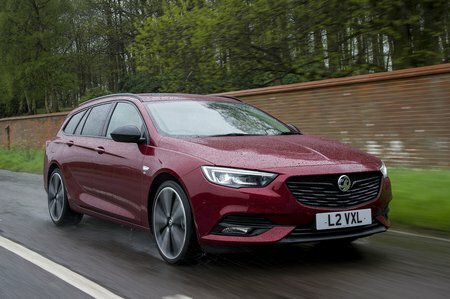 Despite having shed some weight over the previous-generation car, the Insignia Sports Tourer still feels relatively heavy in bends. The steering is reasonably accurate but, as you turn into a corner, there’s a discernible hesitation while its body leans over, and only when it has settled into this jaunty attitude does the car feel happy to change direction. But there is plenty of grip and balance, so you can confidently carry good speed through bends. The adaptive dampers sharpen things in their stiffer modes and allow the car to change direction more keenly. This applies even to the Country Tourer variant, despite its 20mm higher ride height. Meanwhile, sporty GSI Nav trim takes things the other way, with lower suspension that has bespoke adaptive dampers and springs that keep body lean very well checked through corners. Its upgraded Brembo brakes are also meaty and reassuring, imbuing you with confidence. Although you can identify them as diesels from outside, the 1.6 and 2.0 engines are impressively hushed from behind the wheel. At idle and under acceleration, you hear some clatter and feel a few vibrations through the controls, but they're pretty refined by and large. Slot the slick six-speed manual gearbox into top gear on the motorway and you can barely hear the engines at all – and the same is true of the petrols. So that’s the good news. Now for the bad: even with the smallest 17in wheels, road roar is surprisingly noticeable at all times. At motorway speeds, it develops into a constant and irritating drone that on coarse surfaces makes it hard to relax. It gets worse if you add bigger wheels, to the point that noise on 20in rims is quite dramatic in a car designed for motorway jaunts. Wind noise is also considerable and can overwhelm what there is of the engine note.